Lots of tourists visit tropical countries like Jamaica and hardly set foot outside the resort. And I get it — when you’ve got everything you need right at your fingertips (and perhaps you’ve paid for it already in an all-inclusive resort fee), the lure to lounge is strong. But just over a week ago, I had a chance to visit Kingston, Jamaica, where I had some amazing — and amazingly authentic — experiences. 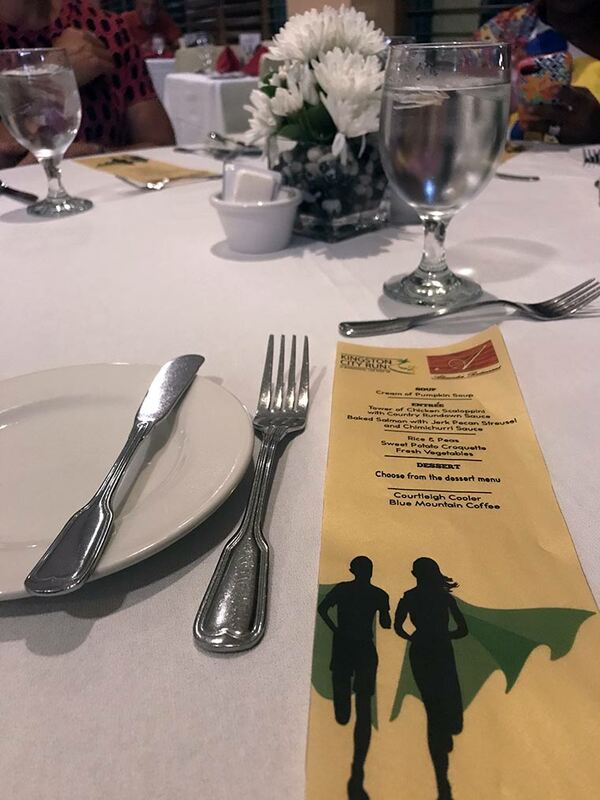 I was invited (along with two other writers, JetSetSarah and Teresa Bergen of Veg Travel and Fitness) by the Jamaican Tourist Board and my travel, activities (which you definitely want to read about over on Fit Bottomed Girls — particularly about the Kingston City Run 5k! ), and planned meals were covered (thanks, JTB! ), but all opinions are solely (and deliciously) my own. Now, all that being said, I should note that I enjoyed a couple of dinners and breakfasts at my hotel, The Jamaica Pegasus, and everything was delicious — I had vegetarian samosas, a vegan red pea soup, a blackened snapper sandwich, and the breakfast buffet had a gorgeous and super flavorful array of fresh fruit that really hit the spot. We also dined at The Courtleigh, at Alexander’s Restaurant, where they offered us a special pre-race menu that wasn’t just tasty, but also made me smile. Look how cute the menu was! And we also had a pretty incredible raw vegan lunch, but that’s coming in a separate post because, oh, I have so much to share about that. Right now, I really want to talk about my culinary experience on Sunday after the race, because not only was it a legitimately authentic Jamaican experience, but it was also pretty adventurous for me. 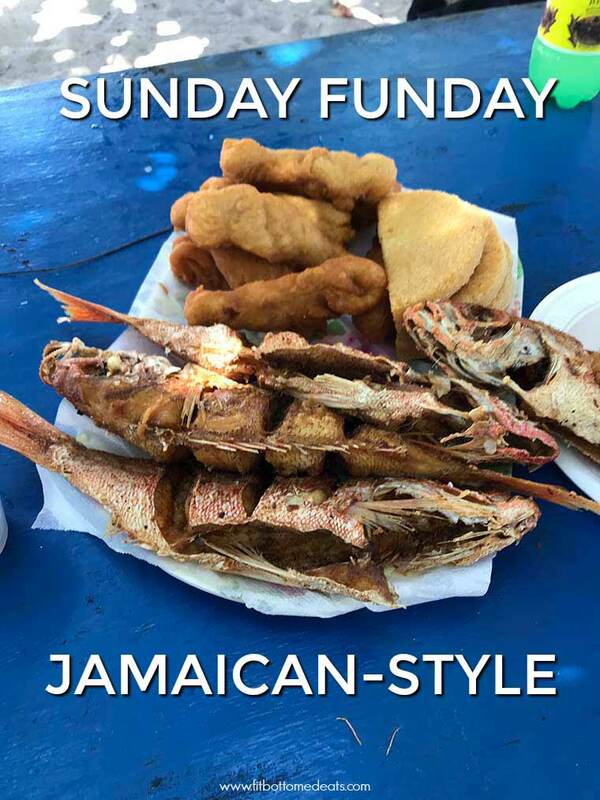 Our guide, Lisa, took us to Fort Clarence Beach, explaining that a very typical Jamaican Sunday involves going to the beach for the afternoon and getting a lunch of fried fish, bammy (fried, flattened cassava bread), and festival (fried dough). If you haven’t done this yourself, then let me assure you that whatever you’re picturing is wrong — and, honestly, not nearly as cool. 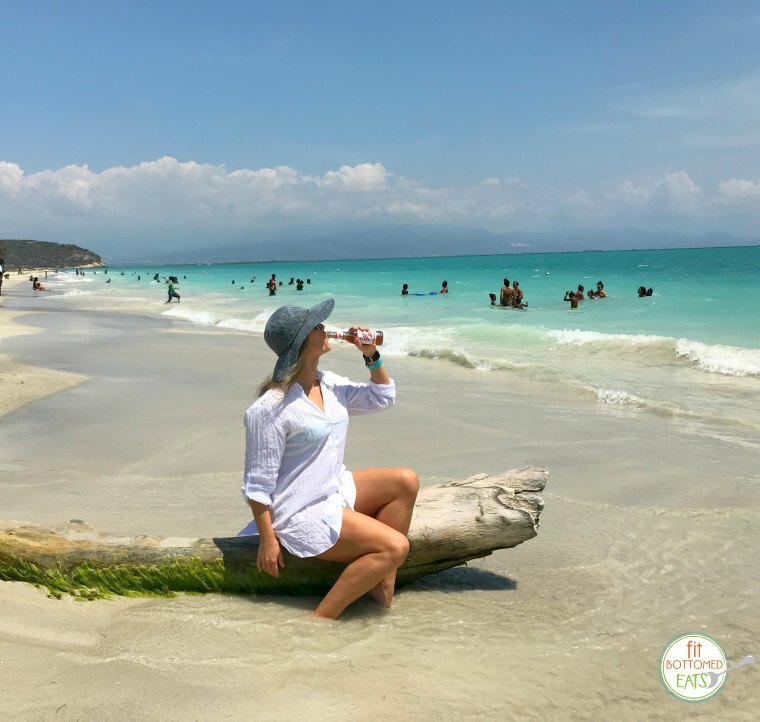 Upon arriving at the beach, we ordered the fish and grabbed some drinks — I opted for the Red Stripe Sorrel, which is only available in Jamaica. Sorrel is a member of the hibiscus family, and the beer also contains ginger, and WHOA, is it a treat. The alcohol content is quite low — probably a good thing, because it went down very easily. The ordering process is interesting, because you don’t simply go up to the window and place an order — you go around to the side, select your fish from the cooler, have it weighed, and then you pay … and you wait quite a while because, well, everyone is doing the same thing. While we waited, Sarah’s friend joined us and ordered pepper shrimp. She offered me one with a couple of caveats: If I couldn’t handle spice, I should not try it, and even if I could, I should start with a small one. They’re seasoned with scotch bonnet peppers, which are incredibly hot, so I proceeded with caution, selecting the smallest one I could find. Even more caution when I realized they all still had heads on them. A few shrimps and a dip in the ocean later, it was time to get down to o-fish-al business. (I’m not even sorry for that one — you know I can’t help myself when it comes to puns.) And now, you see what I mean, right? When I think of fried fish, I think of fillets and breading. This? This was unexpected. I wasn’t about to miss out, though, and I dug right in, pouring escovitch sauce (vinegar, pimento, peppers, and onions) all over it to add some kick and keep it moist. And I’m so glad I didn’t balk, because this was one fantastic, memorable meal. They were out of guava, but had several other interesting flavors. I opted for coconut — a good choice since it was white and ended up dripping all over my white shirt in the hot sun, and also because YUM. In addition to my own great meals, I gathered a few fun foodie facts about The Home of All Right. You ready? Jamaican KFC is different than KFC anywhere else in the world — and, according to basically everyone, is far superior. Legend has it that they received permission from the Colonel himself to use extra spices because the original recipe wasn’t nearly flavorful enough for the Jamaican people. At the Bob Marley Museum (which was his home from 1975 to 1981), you can purchase smoothies at the One Love Cafe … and while the Get Up Stand Up is rumored to be, you know, helpful for the fellas, the Ride Natty Ride is said to be beneficial for the ladies. Certain days are tied to certain foods, according to the Jamaicans I met. On Friday nights, you don’t cook — you go out to eat (often to KFC, where there will almost definitely be a line). Saturdays are for soup, and Sundays, if you don’t get your fill of fish at the beach, you’ll probably enjoy a big family dinner, likely a roast, after church. Nice article! I love that Scotch bonnet pepper sauce.